The solid copper construction allows these alligator clips to be used as both traditional quick electronic hook-up wire clip on test leads as well as soldering heat sinks to protect your most delicate components from overheating, scorching, melting, and other heat related damage. 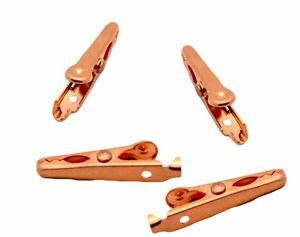 Solid copper alligator clips are chosen by most electronic hobbiest for their versatility as copper is both an excellent thermal and electrical conductor. Superior heat transfer compared to standard steel clip soldering heat sinks.